With the recent healthy living lifestyle, avocados have become a favorite in people’s kitchen. People have also come up with creative ways to incorporate avocados in their diets, such as by making guacamole. This has led to the replacement of butter with avocado products, as avocados have no sodium or cholesterol, unlike the processed kinds of butter. Avocado is a nutrient-dense fruit that is packed with amazing health benefits. They contain monosaturated fats, which improves blood cholesterol by lowering bad cholesterol and boosting good cholesterol. The amazing fruit also contains potassium, vitamin E, C and B6, folate, magnesium, and lutein. This has seen this fruit popularized and widely used because of these amazing health benefits. Guacamole is a dip made with well ripe avocados, mixed with other additives such as pepper, salt, tomato, onions, and generally seasonings to an individual’s preference. To prevent enzymatic browning, lime juice may be added to guacamole. The lime juice also helps the final product obtain a nice color. Avocado is a fruit. Guacamole, on the other hand, is a food product based on the flesh of an avocado. While avocado has no additives and is consumed in its natural state, guacamole is mixed with other seasonings such as pepper, onions, tomatoes, and salt, based on an individual’s preference. This explains why there are many guacamole recipes. Avocados have a longer shelf life as compared to guacamole. Various preservation practices in the preparation of guacamole have been adopted so as to prolong its life. These include adding artificial preservatives, freezing and the use of high-pressure packaging. 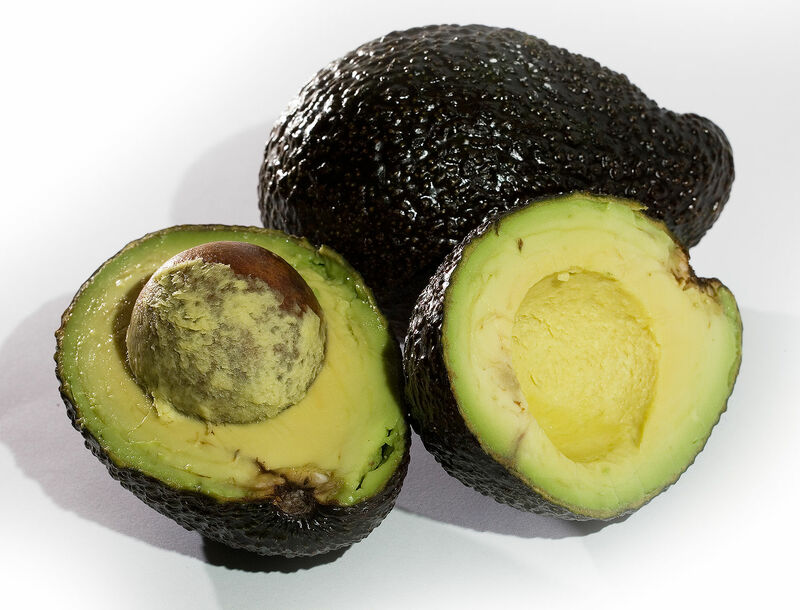 Avocados are used in the beauty industry for creams, soap preparation and also in the cosmetic industry. Guacamole, on the other hand, is for actual consumption. The nutritional components may vary between avocados and guacamole. 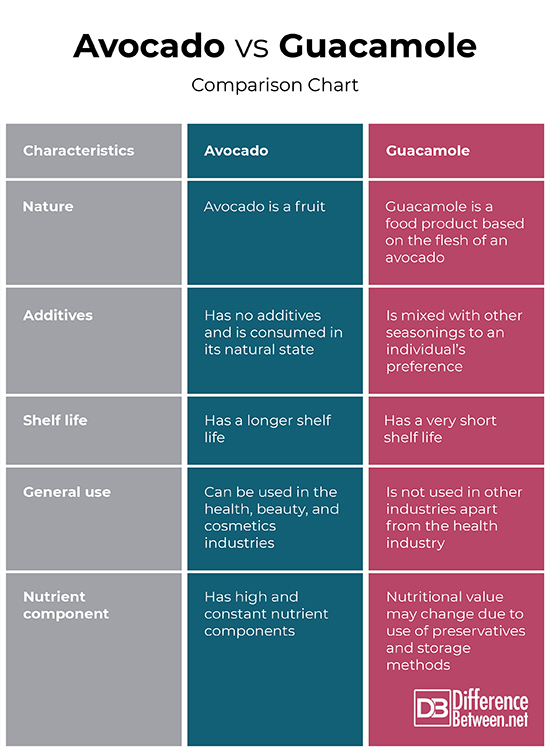 Avocados may have more nutrients than guacamole due to the preservation techniques and storage methods used while making guacamole. 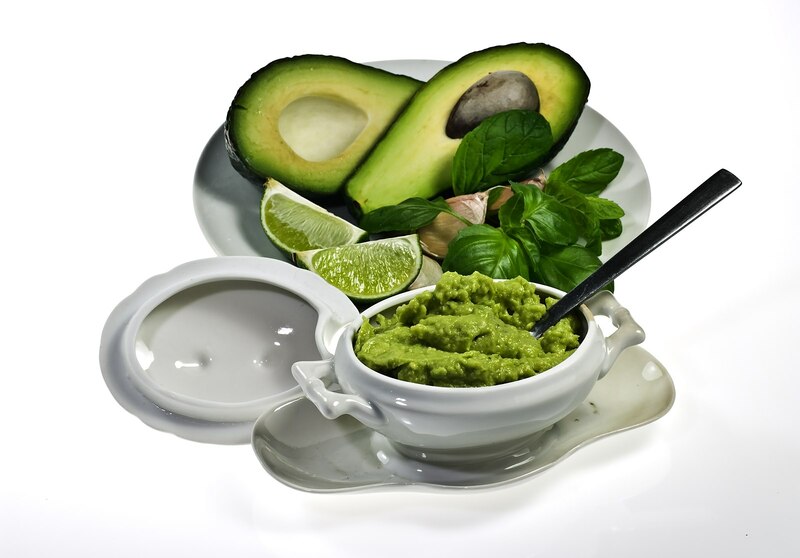 Both avocado and guacamole have played a big role in the health industry as they are both good for people’s health. To get all the health benefits from guacamole, however, people should be sure to consume it when fresh and avoid the ones that contain preservatives and have been stored for long as it very easy to make at home. Tabitha Njogu. "Difference Between Guacamole and Avocado." DifferenceBetween.net. November 12, 2018 < http://www.differencebetween.net/object/comparisons-of-food-items/difference-between-guacamole-and-avocado/ >.